Rain started falling in the early stages of the race, bringing drivers into the pits for a switch to wet tyres. Now, slick tyres on a slippery, wet, concrete pit apron is a treacherous combination and unfortunately, three drivers got caught out. 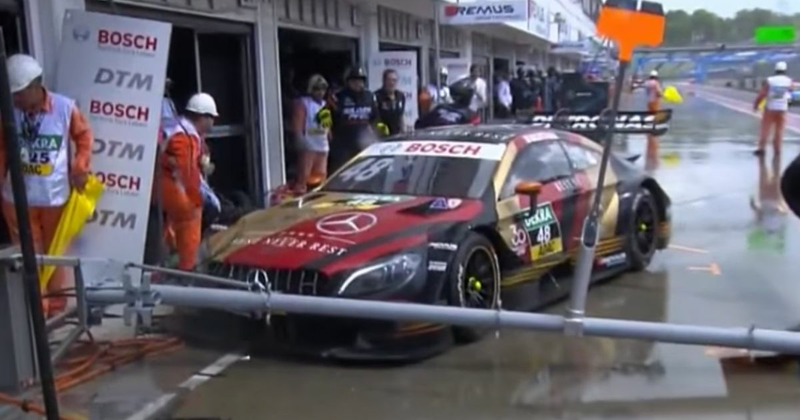 Lucas Auer locked up and ran into the wall of the pit garage, pinning some marshals between the car and the wall. Bruno Spengler also slid into his mechanics, whilst Edoardo Mortara knocked his crew’s pit gantry over.